In July, a couple girlfriends and I hopped on a plane in Oakland and traveled to the Mediterranean for a tw0-week summer getaway. Not only was this my first “girls trip” in a few years, but I lso traveled to my 10th country. It was super exciting to hit double-digits of countries traveled to! The more I travel, the addicted I become and the luckier I feel. One of the things that fascinates me about visiting new cities is how each city that I visit has a different energy. New York is fast-paced, formal, and restless. San Francisco is laid-back, gritty, and unique. Every place has a different energy, a different spirit, and a different personality. In the same way that cities bring to mind specific feelings and personalities for me, brands have their own unique voice and aesthetics. If your brand were a person, who would they be? An exercise that I love to perform with clients is to have them describe their brand as a person. Would your brand be talkative or soft-spoken? Would they be the type of person who tells all the great stories at the dinner party or who spends their weekends hiking? By personifying brands, digital marketing strategy can come alive for even the most hesitant participants. As I like to be someone that practices what they preach, I perform this exercise often. While sorting through all the pictures from our travels, I wanted to design pieces that represented all of the visual and metaphorical elements that I associated with each place. Using cities for the purpose of this exercise is slightly flawed, as visual elements are already provided in the form of pictures, but the main point of the exercise is to translate qualities and tones of something that doesn’t include visual elements into a piece that does include visual elements. In that sense, the bones of this exercise work with a variety of different examples, including cities! When thinking of Lisbon, or Lisboa (leash-boa), I thought of cool toned shadows, dramatic glowing lighting at sunset, and lots of tiled buildings and tiled floors. Plus the hills! We climbed so, so many hills traveling back and forth between our hostel near the waterfront and the shopping and nightlife centers of the city. Lisboa is a creative hub; parts of the city turn from cool shops and art galleries into walk-up bars and live music venues when 11 pm hits. The open container laws make it a mecca for Sagres drinkers. Its proximity to the ocean creates cool climates, even in the heat of July, and the substantially growing tourist market means lots of interesting people to meet and new tours happening constantly. Lisboa doesn’t change personality but each time you meet him, he has something new to offer. A new hobby, a new favorite restaurant, but always maintains the same level of quality. When translating this to a social media, perhaps this platform would share blog posts about hot restaurants, processes, or products. Perhaps there are lots of articles focused on architecture and art. For the hills, I stacked the photos on top of each other and included more photos than I might normally in a collage of this size to show how much content is really packed into the city. There are dozens of areas packed into a city that truly isn’t that large by population or geography. I edited the photos to have a film-like qualities, full of contrast with dark shadows and slightly cool, desaturated colors, to reflect the cool tones of the city and another added level of curated art-appreciation. Lisboa is a person whose house is filled with projects, who studied art in college, and who appreciates a great wine. 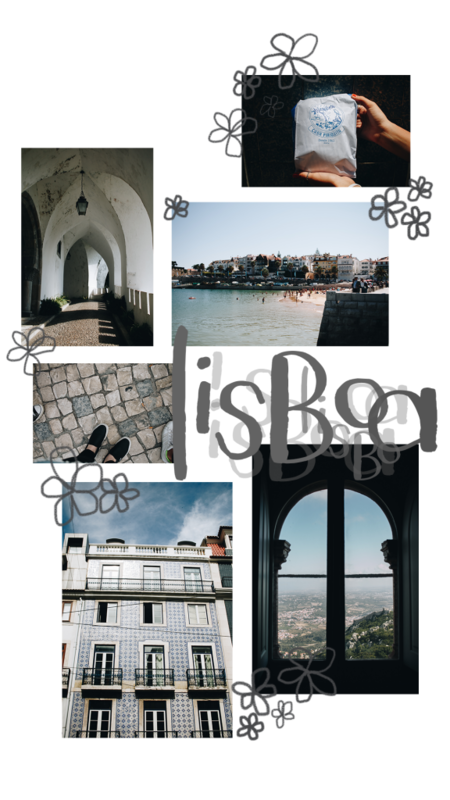 Because of Lisboa’s creative energy, I created a layered projections of the city’s name in a variety of gray tones, along with a repetitive floral pattern, hand-drawn and flawed. Lisboa is definitely the type of person that appreciates authenticity over perfection. When translating this into brand voice, I might include a very personable, conversational tone instead of a more corporate or professional tone. I encourage you to try this exercise with your own brand voice and visual branding. Is your brand professional or conversational? Is your brand loud or subtle? What kind of clothes would you brand wear? Is your brand like Lisboa, wearing some light-wash vintage jeans with a button down shirt, or is your brand like SarahAugustinsky.com, who was partly inspired by Edna Mode from The Incredibles?